Sept. 6 (UPI) — Season 9 of “The Walking Dead” will pick up 18 months after Season 8 of the zombie-apocalypse drama ended, AMC revealed in an official synopsis Wednesday. “By making the unilateral decision to spare Negan, Rick upheld the values his late son, Carl, championed in order to build for the future, but created conflict within his group,” the cable network said in a press release. Peace and safety do not last for long, however. “As time passes, the communities confront unexpected obstacles, danger, and of course, walkers, but nothing quite prepares them for the formidable force they are about to encounter, which threatens the very idea of civilization that our survivors have worked so hard to build,” the synopsis teased. Andrew Lincoln announced last month that he is leaving his role of the heroic leader Rick, although how he will be written off the show remains a mystery. 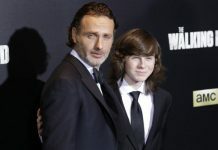 Carl, played by Chandler Riggs, was killed off in Season 8. The series co-stars Jeffrey Dean Morgan as Rick’s foe Negan. Playing Rick’s closest friends are Lauren Cohan as Maggie, Norman Reedus as Daryl, Danai Gurira as Michonne and Melissa McBride as Carol. Season 9 is to begin Oct. 7. A new beginning. And a new chance to make things right. #TWD returns 10/7.